Candida auris is a species of fungus which grows as yeast, first described in 2009. It is one of the few species of the genus Candida which cause candidiasis in humans. Candidiasis is often acquired in hospitals by patients with weakened immune systems. C. auris can cause invasive candidiasis in which the bloodstream (fungemia), the central nervous system, and internal organs are infected. It has recently attracted increased attention because of its multidrug resistance. Treatment is also complicated because it is easily misidentified as other Candida species. C. auris was first described after it was isolated from the ear canal of a 70-year-old Japanese woman at the Tokyo Metropolitan Geriatric Hospital in Japan in 2009. The first cases of disease-causing C. auris were reported from South Korea in 2011, spread across Asia and Europe to arrive in the U.S. in 2016. I read about that this morning in the Times. Apparently it's resistant to all medical fungicides, and is a problem for people with compromised immune systems. Edited by MiltonWadams, 06 April 2019 - 05:38 PM. Just another way Mother Nature tries to keep a handle on the weak to strengthen the population. Too bad we are trying to control that process. My mom was am AMA type nurse when I was a kid. At any sign of coming down with something, I would get wide spectrum antibiotics. No wonder at all that my blood had yeasts flourishing for much of my life, with who knows how many side issues because of it. I have refused antibiotics now for fifty years, taking my chances with letting my immune system take care of whatever bug might get me, and counting on homegrown antibodies to be there next time that bug, or its close cousin, comes by. 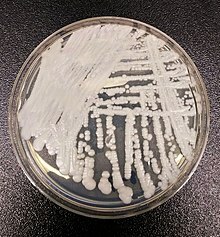 I was a nurse for over 25 years for the military, worked in a lab for most of it, and we saw this candida infestation a lot. I am surprised that it is just now being noticed in the civilian world, or is it just now being talked about ? It would not surprise me if it was not common knowledge outside the military, I saw first hand our governments around the world hide things from the pubic eye. As a native american I feel like one day Mother Earth will shake us off like fleas and wipe us out, we're like a disease, or parasites, and she won't take it forever. There are more deadly and common fungi out there then Candida auris that cant be treated and will habe devastating effects on the healthiest of people. What has been missed by the masses and the true epidemic is that Hospitals are a hub for spreading this fungi-virus. At the end of the day, if your immune system is compromised, you have much more greater threats to your health then this yeast. Im not saying this isnt a threat as it kills 60% of the patients that developed a invasive infection but as of right now there are hundreds of other pathogens hiding in your home that can leave a person with a weakened immune system very vulnerable.